BBQ – Everyone loves the summer because this means the BBQ is all dusted down and ready for action! We love this time of the year, and for a number of months stock a massive range of meats in in some great tasting rubs and marinades that are ideal for the BBQ! You will find over 7 varieties of kebabs, 6 varieties of burgers, 10 varieties of sausages, along with things, drumsticks, wings, ribs, pork steaks, chicken strips and many more all in some of our exciting marinades such as smokey BBQ, Chinese, hot and spicy, sweet chilli, garlic butcher, rosemary and garlic, piri piri, rosemary and redcurrant, garden mint etc. etc. If for whatever reason you cannot find the product you want, in the marinade you want, let us know and we will do it there and then whilst you wait! 50/50 deal. 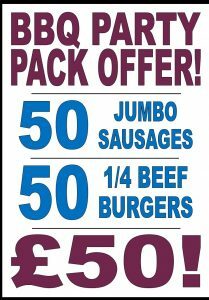 Over the last 2 years our most popular BBQ offer has been our 50 / 50 deal; 50 Jumbo pork sausages and 50 homemade ¼ burgers for just £50! Great value offer perfect for hosting large BBQ parties. What’s better is that all the sausages and burgers are made fresh daily so if you don’t use them all, freeze them down and save for a later date!